Find out how to overcome the difficulties associated with VMware Capacity Planner and other capacity planning tools. VMware Capacity Planner (CP): It's not without challenges. Firstly, for some organisations, the idea of an agent collecting data and reporting outside of the perimeter of the network is something they struggle with. Although the data is redacted in such a way to make it almost useless if it intercepted, some data must remain in order for it to be useful. In recent years, I've heard anecdotally from my customers that they are offered VMware Capacity Planner projects free of charge. I understand it is possible to hold this data locally and then send it to VMware by other methods. Secondly, the Capacity Planner software reports its data in such a way that you really need an expert to interpret and present the data to the organisation. Although training courses do exist, the VMware PSO team and VMware Partners mainly attend them. The reality is that VMware Capacity Planner is generally not sold as an off-the-shelf, shrink-wrapped product but as a service provided by either VMware or one of its VMware Authorised Consultancies (VAC). That does mean that you have to work closely with your partner to achieve the results you are looking for. It's also very much dependent on the quality of the people who carry out the project. The VAC program is widely respected, but like every program, it's by no means a guarantee of success. In recent years, I've heard anecdotally from my customers that they are offered VMware Capacity Planner projects free of charge. Much depends on the size and scope of the virtualisation project, and the offer is not made to all and sundry. When VMware makes this offer, I think you can rest assured that you would receive a quality delivery from their team of SEs. I would err on the side of caution, however, when smaller solutions providers and VACs offer the same deal, especially if your initial project is on the small size. The bald truth is that in life, as in everything else, you get what you pay for. I've heard of stories of the VMware CP agent only being present in the organisation for a week or two. In my humble opinion, I don't think this is sufficient time to really count as a valid CP exercise. In my own mind, I think any automated analysis tool must really be run for a six-week period or longer for the data collected to be of value. The truth is you should be somewhat wary when you're offered a free service such as VMware CP from these smaller solutions providers. Admirably, they are taking this approach to squeeze out competitors and bump up your value for money. But it can lead to a degraded quality of analysis and a skewed or half-complete capacity planning exercise can be as bad as none at all. Some years ago, Novell acquired the PlateSpin Company, who were known for the P2V conversion tool (PowerConvert, now called PlateSpin Migrate) and their capacity-planning tool PlateSpin Recon. At the time, some analysts saw the acquisition as a kiss-of-dead for PlateSpin. Those analysts have been proven incorrect, and Novell has allowed PlateSpin to continue to operate at arms length. On one level, Recon looks and feels very similar to VMware Capacity Planner. Architecturally, it is quite different, with its data stored on a local database rather than sending the data to an external source, as is the case with VMware CP. The Recon utility is looked on favorably by many of my peers, primarily because it lacks the complexity of the VMware CP and because it can be bought off the shelf as ordinary software. The real "cost" of VMware CP is not so much the software but the services that are bundled with it. If you have relatively able staff, then you can carry out the capacity planning exercise internally. In a recent poll of my peers, the vast majority opted for the Recon product for these reasons. 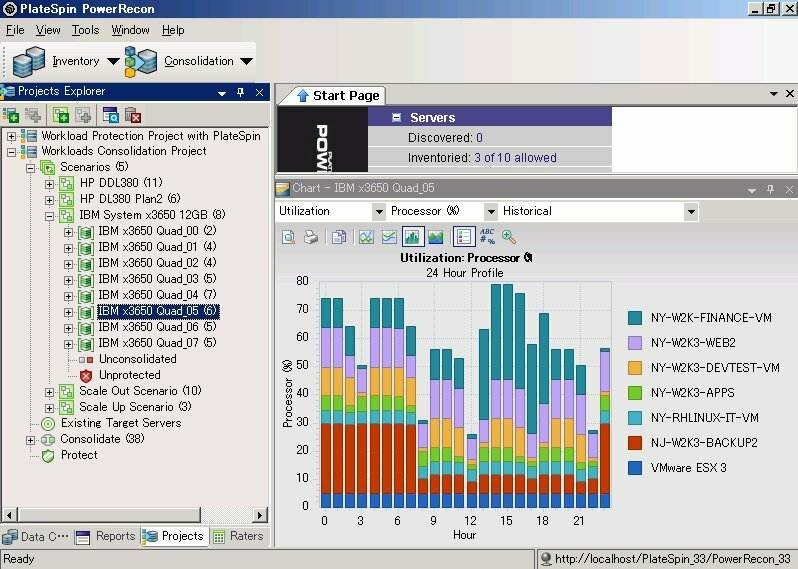 One of Recon's main selling points is its "agentless" collection of performance and system data. Agents that are installed to the physical machine are often frowned upon because they can cause many headaches such as being treated as a virus by anti-virus systems or picked up by intrusion detection systems. In fairness to PlateSpin, I can see where the confusion can come from. It's true that you can collect performance data remotely without the need for an agent. However, that will only collect a certain volume and type of data covered by the API. If you want a higher level or quality of data, then frequently an agent will need to be installed. Most capacity planning management systems have this limitation, and the vendors do attempt to tell us you can have your cake and eat it, too. The truth is, you can't. If you want a high quality of data, you're looking at some kind of compromise one way or another. Laying that bone of contention to one side for a moment, another reason Recon has proved itself be popular is that in recent releases the company has seen fit to expand its range to include physical systems that fall out of the scope of x86/x74 systems such as UNIX, AIX workloads and Solaris. The reality is that PlateSpin has already begun that part of the journey. The new edition, which was released late last year, includes tools that enable the datacentre administrator to show that the virtualization project has been a success -- what PlateSpin call "proof-points." They change their licensing model to reduce the cost of this post-conversion period and allow for ongoing analysis of virtual clusters in their virtual infrastructure reports. PlateSpin "Virtual Capacity Management" finds underused resources in your virtualised IT environment, and by reporting on the available resources, it lets you reclaim or reassign allocated resources.